Fig. 36. Lily Maisky (right - fruit). Lily of the valley - a perennial herbaceous plant. Contains cardiac glycosides (see), saponins and other biologically active substances. Lily has a strong cardiotonic, and sedative effect. Drugs Lily of the valley (korglykonum and converstatin) have an effect that is similar to the action strofantina (see). Indications and contraindications to the use of drugs Lily of the valley are the same as for strofantina. Tincture of Lily of the valley applied mainly neurosis of heart. In may the forest like a green haze shrouded: bloomed the first sticky leaves. Happy spring warmth, light. At this time blossoms the most elegant and the most fragrant spring flower - Lily Maisky. It can be found in shady places almost throughout the forest zone of the European part of the USSR to the Urals, in the Crimea, the Caucasus and the far East, in Siberia almost not growing. Lily that Grows in the Crimea, Northern Caucasus, Transcaucasia,- a special kind, the Transcaucasus, and the one that grows from Eastern Transbaikalia to lower reaches of the Amur river, in the lower parts of the mountains, on the coast of the sea of Japan, a separate view - the Lily of the valley Kaske, more powerful with large dark green, sticking up leaves. Bells his flowers wider. All parts of plants containing cardiac glycosides. Apply landysheva drops in heart disease, both independently and in combination with preparations of Valerian, hawthorn, motherwort. In the first years of life Lily does not bloom. Only after 2-3 years on the rhizome is developing a large kidney. In the spring of her shoot grows and disclosed like porcelain flowers. Then again 2-3 years break until rhizome develops large kidney, which will give the flower escape. The leaves of Lily of the valley in medicine valued not less than flowers. Prepare them 2-3 weeks before blossoming, then they are richer medicinal substances than collected during flowering. Collect flowers and leaves only in dry weather, after drying dew. To cut plants should knife or scissors in 3-5 cm from the soil, not a tear, not to damage the roots. In order not to mess up the sheets, they loosely placed in a basket and a cover from the sun. Dry in a shade, outdoors, in the wind, put a very thin layer separately flowers, separate sheets. To do it quickly, because the collected plants will soon deteriorate. In the vicinity of large cities almost destroyed these precious plants. Now adopted a special resolution, which prohibit the collection of around many cities of flowering plants. You cannot collect Lily Maisky and in some areas of Central Asia, where it is rare. Drugs Lily of the valley. 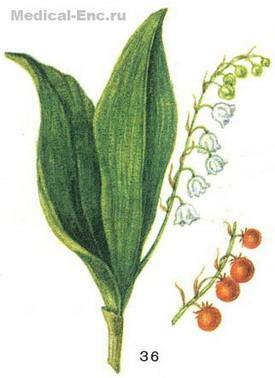 Tincture of Lily of the valley (T-ra Convallariae; list B), assign inside of 15-20 drops 2-3 times a day, the highest single dose of 30 drops, daily-90 drops; part Zelenin drops, consisting of tinctures Lily of the valley, and Valerian (10 g), tinctures herb (2.5 g) and menthol (0.1 g). Korglykonum (Corglyconum; list B) - as novogalenovye drug leaves of Lily of the valley, is injected into a vein slowly at 0.5 to 1 ml; production form: ampoules to 1 ml 0,06% solution; converstatin (Convallatoxinum; list a) - cardiac glycoside, injected into a vein slowly at 0.5 to 1 ml of 0.03% solution; the release form: ampoules to 1 ml of 0.03% solution. Korglykonum and converstatin before the introduction dissolved in 10-20 ml 20-40% glucose solution.